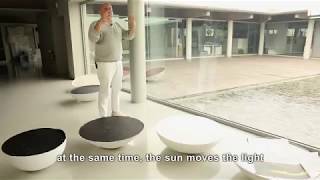 Foscarini Solar Outdoor is a new type of object, a contemporary hearth around which to gather and chat, at home or outside. The outdoor version has a characteristic rusty and textured effect finish. The hemispherical body, made of polyethylene, is stable even when it is tilted by 15°. The angling determines the quantity of light diffused, allowing multiple effects and atmospheres to be created. This light is also available as an indoor version (with a choice of two different finishes), please see the 'related products' section below for more information.